International Self-Care Day (ISD), on 24 July each year, provides a focus and opportunity to raise the profile of healthy lifestyle self-care programmes around the world. ISD provides a media-friendly forum and a focus for individuals and groups to (independently) promote self-care in their organisation, community and country. ISF is pleased to see that International Self-Care Day continues to expand around the world, involving thousands of people in many different countries. For ISD 2018 we were delighted to see for the first time organisations in Spain and Iran being involved. In keeping with the stand-out use of ISD by many organisations in Canada, Nova Scotia Premier Mr Stephen NcNeil request an ISD lapel pin to wear on the day. 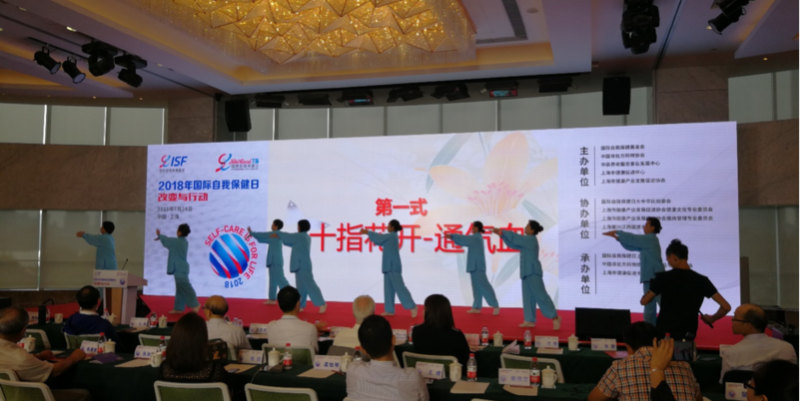 ISF itself organised an ISD event in Shanghai, China, where participants enjoyed a range of activities, presentations and performances. The photograph shows a gentle dance performance from cancer sufferers, reminding us that physical activity is a vital part of self-care for everyone, including those with a serious medical condition.